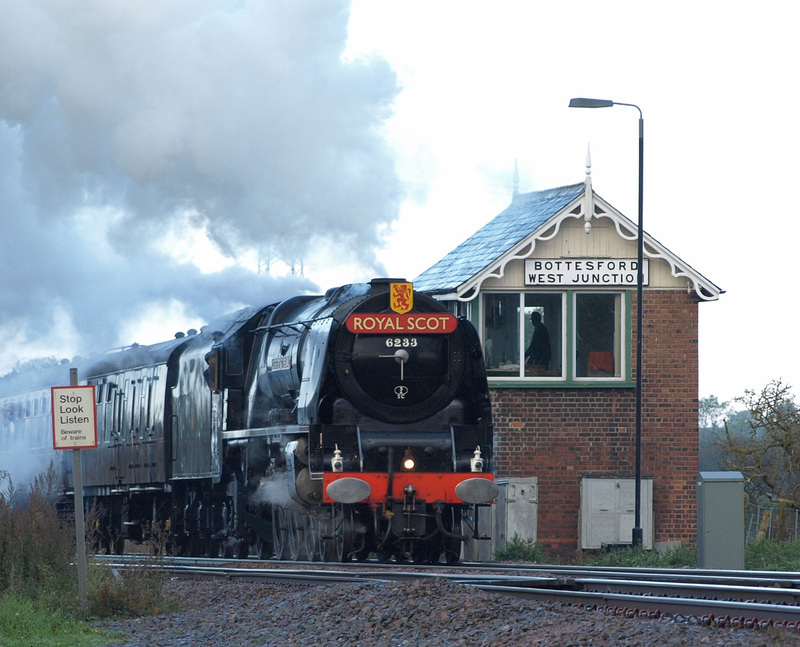 You are here: Home>Bottesford Today>Out and About>The "Duchess of Sutherland" passes through! 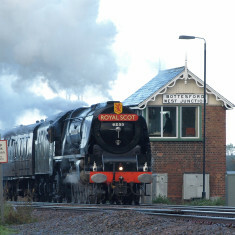 The steam engine Duchess of Sutherland hauling the Royal Scot through Bottesford, October 17th, 2009. 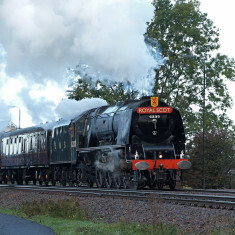 The restored Duchess of Sutherland hauliung the Royal Scot towards Bottesford, October 16th 2010. 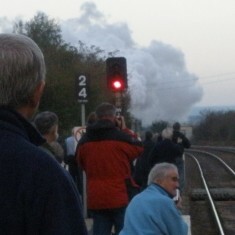 It’s a quarter past eight on a sunny October morning in 2008 and the enthusiasts are gathered on the platform, awaiting the Steam Special en route to Grantham and then on to Kings Cross. A rapid pulse like a racing heart can be heard in the air as she approaches still hidden around the bend in the track. Cameras are trained, lenses focussed, fingers itching on the shutter release. 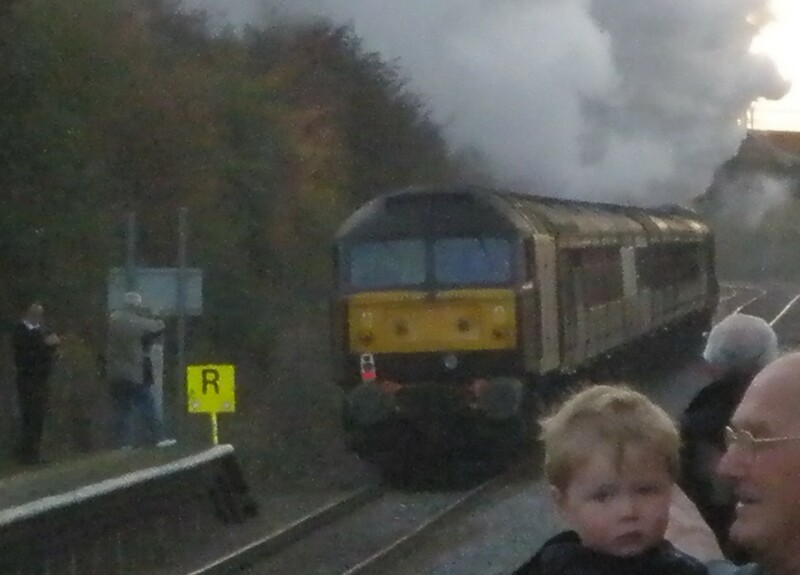 The plume of smoke rises over the trees by the level crossing on Normanton Lane, then there she is, racing, an unstoppable force, charging over the crossing by the station, the rythmic confident sound of the pistons smooth and, to me, surprisingly quiet. You take a photograph and then before you are ready to take another she is past and your next shot is of the receding carraiges behind the sleek streamlined mass of the engine. 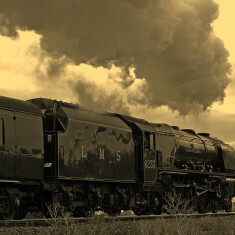 The plaque on the front of the locomotive said “Royal Scot“, the name plate on the side of the engine read “Duchess of Sutherland“, a mechanical marvel of a byegone age still well capable of matching the anonymous diesel cars of today. 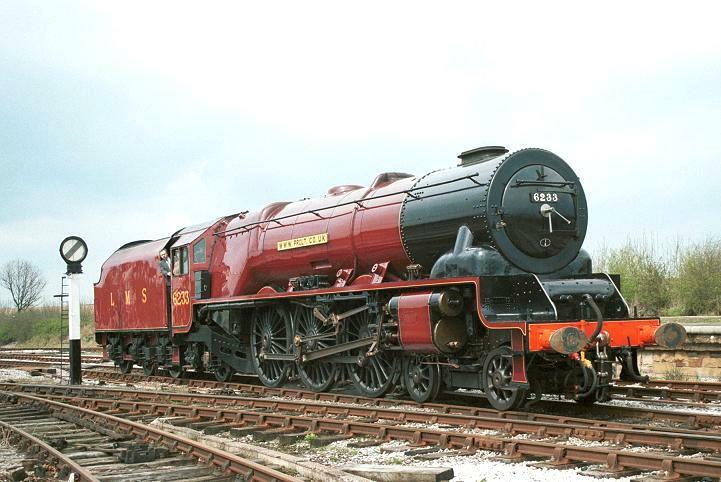 To be precise, this was LMS Princess Coronation Class 6233 Duchess of Sutherland, originally built at Crewe Works in 1938 at a cost of about £13,800. 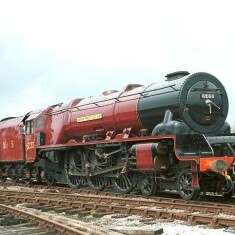 She has been restored by the Princess Royal Locomotive Trust. 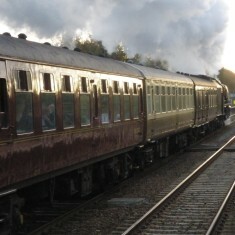 She was hauling a day excursion train, the “London Explorer”, from Sheffield to Kings Cross and then returning in the evening (six hours to enjoy yourself in London, though I doubt this would compare well with the journey itself). 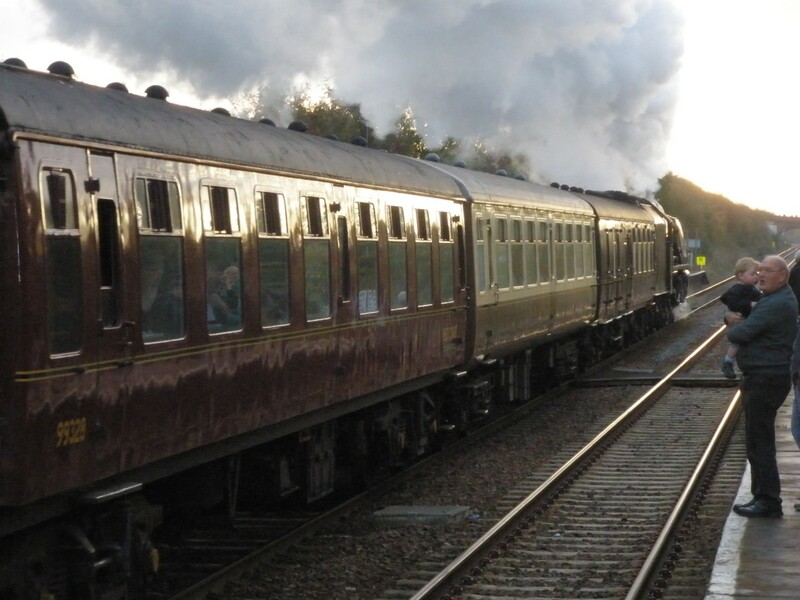 Driver Bill Andrew and fireman Mr Woods brought the train into Kings Cross only 9 minutes late, having attained a maximum speed of 78 miles per hour between Woolmer Green Junction (south of Stevenage) and Welwyn Garden City. 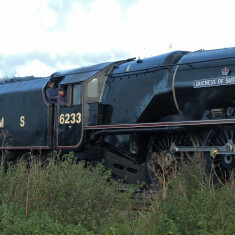 A detailed description of the loco is available at Wikipedia. Instead of a guards van, the rear of the train consisted of Class 47 diesel locomotive 47826, itself a bit of railway history, that was used to supply electrical power to the air-conditioned coaches. The whole load amounted to 12 coaches plus the diesel engine, making 583 tons. 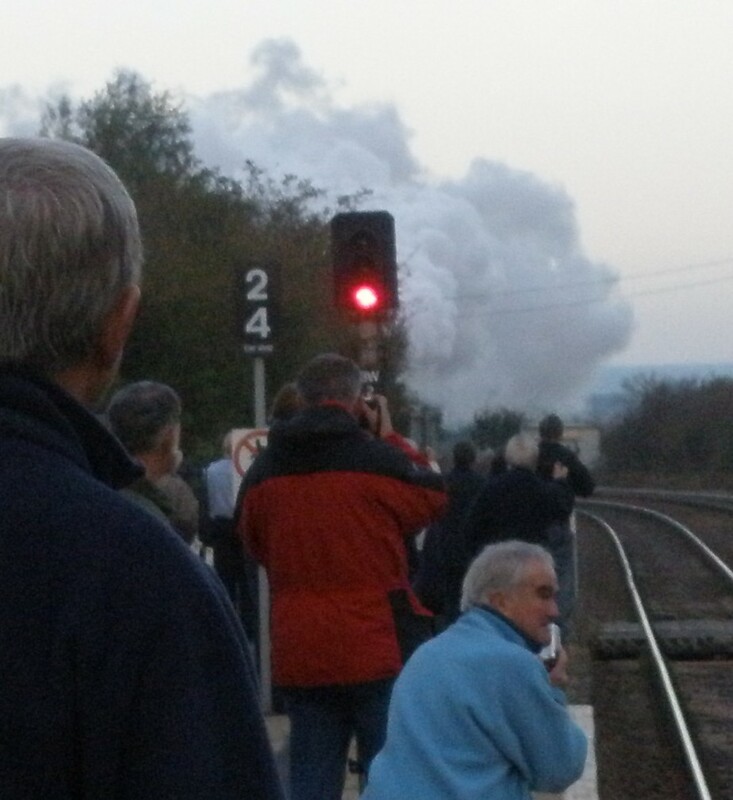 Someone said “They should have kept the steam trains. With modern technology they would be up to date.” You have to wonder if he wasn’t right, with the rising price and forecast scarcity of imported fossil fuels. 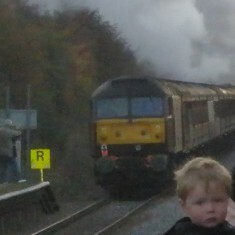 The train seemed to be carrying ghosts along with its live passangers. Not just the ghosts of poets like WH Auden and John Betjeman, but of the railway workers, the station staff, the office workers, school children and holiday makers that used to work at, or pass through, Bottesford’s station, its complex junction, goods yard and signal boxes. We are ever more dependent on electronics, in our cars as much as in our computers, and how many of us really understand how it all works. 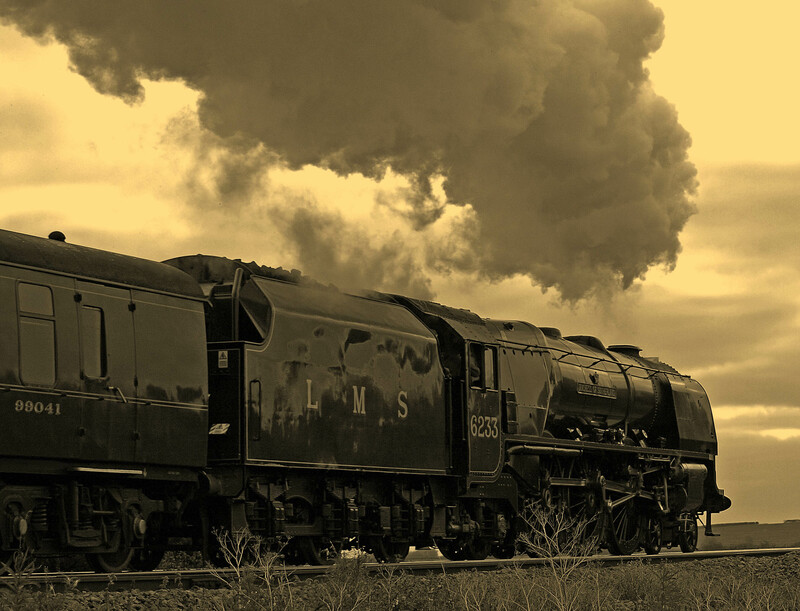 Steam engines seemed old-fashioned, and the move to diesel and electric trains was seen as self-evident ‘progress’, and yet the grand old Duchess and her sisters hauled trains with no electronics at all, something that now feels almost miraculous. 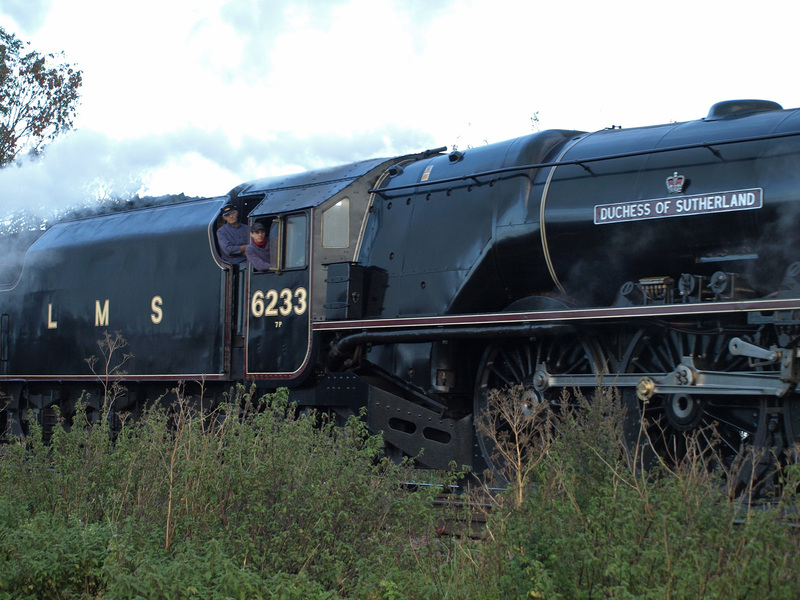 Nevertheless, the internet is here to stay, and if you have any pictures of this and other steamers that have passed through Bottesford that you are willing to share with the Living History Project please email them to info@bottesfordhistory.org.uk or call Neil on 843320. 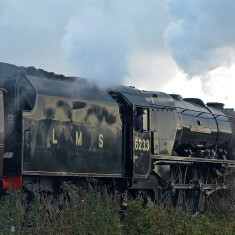 Or add a comment to this page – can you tell us the design and history of the Duchess of Sutherland? 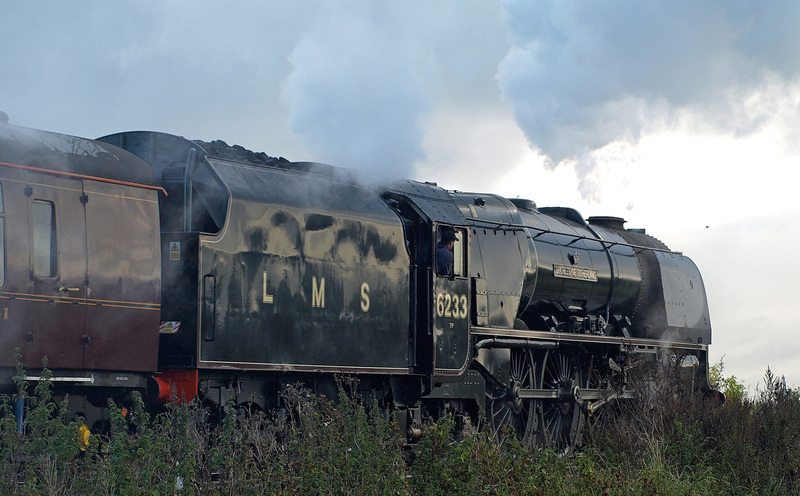 We are indebted to Mr David Tinkler of Lowestoft for his contribution of information about the journey and the technical specification locomotive No.6233. 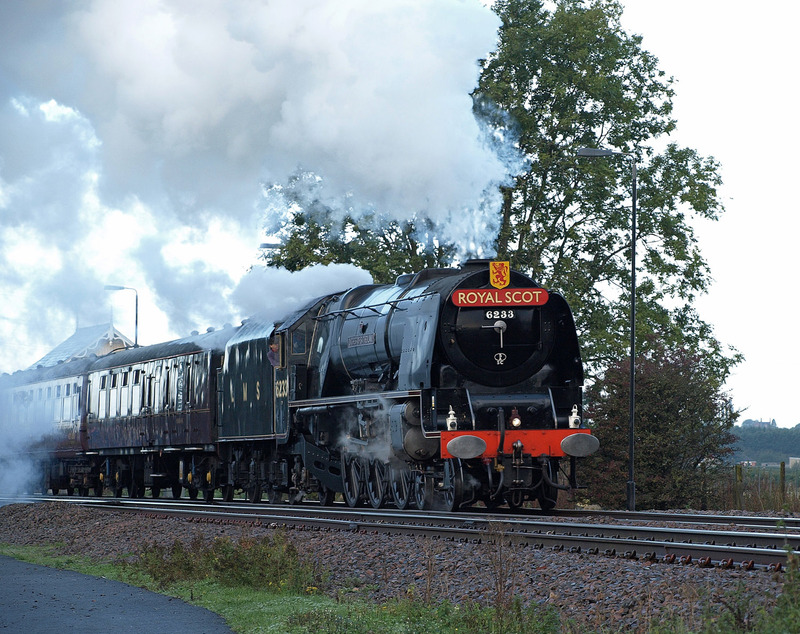 We are also indebted to Ashley Waterfall, who has allowed us to add some of his photographs of the Duchess as she passed through Bottesford in 2009 and 2010. This page was added on 18/10/2008.